How much does a dehumidifier cost? • The Air Geeks, reviews of air conditioners, dehumidifiers and air purifiers. Blog, Dehumidifiers » How much does a dehumidifier cost? 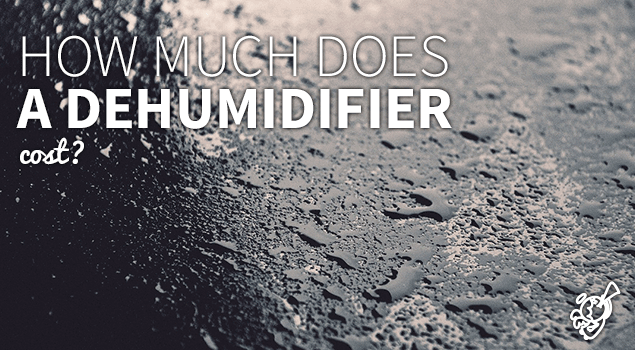 How much does a dehumidifier cost? Here is the “joke” in our trade: what does dehumidifying cost? Well, still less than not dehumidifying! Indeed, excess moisture can ruin the environment of your room and damage your valuables, undermine your property’s value, etc. To make sure that the relative humidity of your room remains within the desired range, you should get a suitable dehumidifier. But how much does a dehumidifier cost? The prices vary depending on many factors. However, the cost of buying a dehumidifier is lower than that of replacing damaged items. In most cases, the size of a dehumidifier is given in terms of the amount of moisture that it pulls in a day. Some high capacity dehumidifier can pull as much as 90 pints of moisture from the air in 24 hours. Such humidity control systems are suitable for large living rooms, offices, computer rooms, server rooms, et cetera. On the other hand, there are low capacity humidity control systems that are designed for small spaces. Such units are only capable of pulling little amounts of water from the air in a day. They are suitable for small spaces such as safes, small boats, bathrooms, and so on. The price of a dehumidifier is mainly determined by its capacity. Most 70 pints dehumidifier cost between $ 250 and $ 350 depending on the brand. These high capacity humidity control systems are suitable for large spaces. The recommended sizes vary from one model to another. If you are looking for a humidity control system for a small to medium-sized room, then you should go for a 50 pint unit. Although the prices vary from one model to another, most of them cost between $ 170 and $ 240. In case you are looking for a dehumidifier for your relatively small space, then you should go for a 30 pint unit. Some dehumidifiers are designed to offer lower capacities depending on the applications that they are designed for. The prices of low capacity dehumidifiers range between $120 and $ 180. The cost of buying a dehumidifier is also greatly determined by the features that it offers. For instance, humidity control systems that feature built-in pumps are usually more expensive than those that don’t have them. In addition, the cost is also determined by the design of the appliance. Rugged dehumidifiers are usually more expensive because they are durable. Other factors include reputation of the brand, and technologies used.